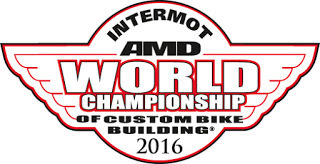 WE are pleased to announce that the 2016 AMD World Championship of Custom Bike Building will be staged at the internationally acclaimed INTERMOT expo at Cologne, Germany, in October 2016. Having made a successful debut in Europe at Big Bike Europe in 2013, the opportunity to move the Championship to INTERMOT in 2014 proved a great success - with an estimated crowd of over 100,000 high-mileage 'mainstream' riders seeing custom bike builds of AMD World Championship calibre for the first time. The reaction of the builder and competitor community to having such an opportunity was universally positive. As a showcase for custom motorcycle design and engineering, the AMD World Championship "fits well" in the environment of an expo like INTERMOT, according to AMD owner Robin Bradley. "The custom industry needs new customers. Simple! The idea behind the program when it started in 2004 was that it would act as a lens through which those who have never seen custom motorcycles as being their preferred riding experience option, can see just how much the custom market has changed. "Not least in terms of the incredibly high standards of design, engineering, craftsmanship and innovation that a market once seen as the preserve of outsiders now offers for all. The custom market has become mainstream, and our industry needs to embrace and exploit all possible opportunities to bring fresh customers into our shops." Owing its origins to the early 1960s, the "Cologne Show", as INTERMOT and its predecessor event have been known, have always been regarded as the world's primary expo for motorcycle technology and new model introductions. Above all, INTERMOT has established Cologne as the leading international motorcycle industry gathering, with over 200,000 trade and public visitors in total. in which engineering values will be at a premium as a new generation of consumers comes through. "These new consumers expect the custom bikes to be fully engineered to OE standards and fully compliant with prevailing and future regulations. These kinds of riders just don't go to traditional custom shows. The market needs to do things differently to reach them, and needs to offer an ever greater diversity of styling and riding experience in order to motivate them". This year will see the debut of an important new AMD World Championship Affiliate event - The Championship of the Americas - at AIMExpo at Orlando, Florida, in October. This will provide a new pathway for customizers in North, Central and South American to engage with the AMD World Championship program. "Now that we know we are going to be staging the AMD World Championship at INTERMOT biennially we will 'take a view' about future frequency once we have gauged industry response to the program's involvement at AIMExpo. "We still have several options to stage the AMD World Championship annually in the future, including using our own Big Bike expo concept, at Cologne or elsewhere, and we also have significant other expo and event players talking to us about 2017. "That said, we would also be perfectly happy to see it settle into an alternate-annual frequency. Given the nature and standard of bikes that the AMD World Championship is about, a 24-month cycle would recognize the extraordinary investment in creativity, time and craftsmanship that goes into the world's greatest custom bike builds. We will re-visit 2017 plans next Spring".